You are here: Home > What? Natural childbirth advocates don’t support Beyonce’s choice? What? 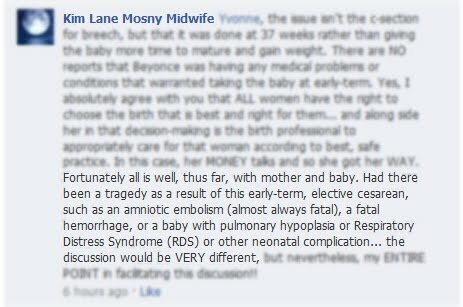 Natural childbirth advocates don’t support Beyonce’s choice? If there is one thing that natural childbirth advocates are very clear about it is supporting women’s choices in childbirth. Women have the right to make whatever decisions they want about their own bodies. 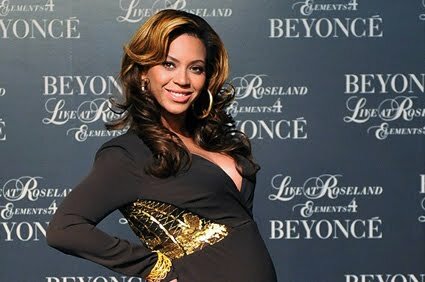 Therefore, NCB advocates loudly and wholeheartedly support Beyonce’s decision to have a C-section. Wait, what? They DON’T support Beyonce’s decision? Well maybe it’s because it wasn’t medically indicated. There was no reason for Beyonce to have a C-section. She was just too posh to push. Wait, what? There was a medical indication? The baby was breech? Okay, but that doesn’t mean she couldn’t have had a vaginal birth. Breech vaginal birth is safe for all babies. That’s what studies show. Wait, what? Breech birth is only safe under certain very stringent conditions? And even then it increases the risk of neonatal death? Okay, maybe the C-section was medically indicated, but certainly not the timing of the delivery. Wait, what? Beyonce could have had premature rupture of membranes, pre-eclampsia, intra-uterine growth retardation or any of a host of other medical indications for early delivery? But think of everything that could have gone wrong! These very serious, indeed life threatening complications are very common. Wait, what? These complications are rare? They are far less common than the life threatening conditions of pre-eclampsia, intra-uterine growth retardation or neonatal sepsis? Well at least Beyonce took to heart the natural childbirth advocacy belief that women must give birth in privacy and in the way that they are the most comfortable. That’s why NCB advocates thoroughly support Beyonce’s decision to rent an entire hospital floor to be sure that her privacy was not invaded. Wait, what? They don’t support her decision to create privacy for herself? Privacy is only for those who choose to give birth at home? But good people can disagree. That’s why Kim Mosny, CPM allows everyone to express their opinions on her Facebook page. Wait, what? Dissent will not be tolerated? In the end, though, all that matters is a healthy baby. That’s why NCB advocates support women in choosing breastfeeding or bottlefeeding.